Antoni Cimolino’s Macbeth could be considered a traditional Macbeth by setting it in the 11th century. But this is a production that goes bump in the night and carries with it an air of mystery similar to an old monster movie. The feeling of the show reminds me of Ichabod Crane’s Sleepy Hollow or the village terrorized by Frankenstein’s monster. This is the world of the weird sisters. The forest they inhabit extends over the Festival stage. The forest remains a key focus even when the characters are in Macbeth’s castle, which seems to suggest the witches never truly leave Macbeth’s presence. The set and lighting design worked incredibly well together to create the creepy atmosphere. Barren and cold branches extended all around the stage and up toward the roof. The mossy forest floor covered the majority of the stage. The turf also jutted out at the top of the thrust toward the audience which further brought us into the story. The lighting design was beautifully eerie. Before the show began, the white and blue lights extended thinly through the branches and created the feeling of a smoky fog. The 11th century setting impacted the lighting within the castle and gave the illusion of everything being lit by four candles on the stage. The candlelit atmosphere was nice because it kept everything feeling spooky. The limited lighting heightened the appearance of the shadowy areas. This is a Macbeth where darker forces are lurking in the shadows and where characters no longer see things clearly. Now let’s talk about our main man Mackers in this show. Ian Lake steps into the role of Macbeth and his Macbeth is feverish and youthful. Also thank you to Cimolino for the artistic choice of making Lake shirtless a lot. Okay but seriously that was the right choice! It showed he was young and fit and desirable. Lake’s Macbeth is insecure and fearful about what he needs to do in order to be a ‘man.’ In this case, the discussion of gender is related more to the topic of growing up. Killing Duncan = the younger generation replacing the older. But Macbeth did not wait to be king and therefore does not feel secure as king. Macbeth’s tyrannical struggle for power which results in him murdering Banquo snowballs from his own insecurities about leading. Lake’s Macbeth is also impulsive and rash. He makes decisions based on his lack of security and quickly returns to the origin of his power which is murder. The decision to murder Duncan also comes from the motivation Macbeth receives from his wife (played by Krystin Pellerin). The relationship between Macbeth and Lady Macbeth in this version is different than any other I have seen previously. The couple begins as a team and there is definite heat in their relationship. The discussion about the witches and Duncan’s impending arrival takes place as Lady Macbeth washes his husband after his return. But after the death of Duncan, the couple struggles to remain on the same level mentally and emotionally. This is where the relationship takes a turn from what I have seen in the past. Pellerin’s attempt to keep her husband in check is less about them losing power and seems to be genuine concern about him (and how they are perceived). Lady Macbeth’s insecurity derives from their marriage crumbling and her husband’s sanity wavering. The famous banquet scene is Lady Macbeth’s breaking point. But interestingly, her guilt about the murder seems less about murdering someone and more related to what the event did their marriage. It is almost as though she believed their strength as partners would remain the same despite the horrendous deed they committed. Her ‘crazy’ comes from their inability to fix one another and save each other. Furthermore, the weird sisters’ prophecies push Macbeth forward but the decision to kill Duncan stems from his own mind. I like to think of the witches in this production as symbols of a much larger darkness lurking within the story. They are physical representations of a darkness that does not only exist in the witches but within the evil thoughts of the characters. I should also add how much I enjoyed this trio of women working together. They were rhythmic and fun and felt like a force of nature. One of the most breath taking moments at the end of the show takes place during the hailing of Malcolm as King of Scotland. Everyone who has helped win the battle has lifted Malcolm up and is huddled together. The lights fade to dark and then suddenly everything flashes into a tableau and lights reveal the witches standing around the new king. Ahh! So creepy. A clear implication this new king could be as dark or tyrannical as Macbeth. The message is striking and clear; darkness can exist within us all. I’d quickly like to touch on setting it in the 11th century once again. We like to trick ourselves into believing that people in Shakespeare’s day were just superstitious and we are extremely different than those who hunted witches or believed in devils. 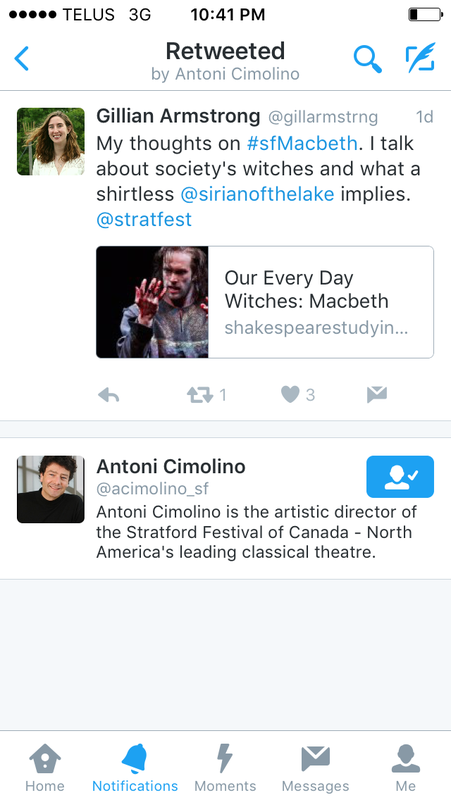 But Cimolino’s Macbeth is a stark reminder that darkness and fear and insecurity are the real witches and they exist in every century. Setting it in the 11th century implies the world of Macbeth is far from our society. But by the end of the show, Stratford’s Macbeth makes it frighteningly clear how darkness and corruption looms in every part of history.